On a weekend drive in the country on Ile d'Oléron, an island off the Atlantic coast, we see a sign advertising not just a vide grenier (literally "empty the attic", what we'd call a garage sale) but a vide maison. Emptying a whole house. Since neither Pippa nor Anthony are with us to complain about how boring and impractical this is, Gigi and I naturally stop to shop. And find some seriously impractical treasures. But definitely not boring. Say hello to the souvenir we decide that Gigi must have when she's all grown up and serving pastries in her house: a set of 11 dessert plates, and 1 matching serving plate, Céranord St. Amand, semi-vitrifié, decorated with Jean-Honoré Fragonard paintings of Lords and Ladies (damsels and dudes?) in 17th century France. Given her absolute love of this time period in French history, and of old-fashioned dresses, I simply cannot pass it up. And now, given my love of garage sales and the fact that it's vide grenier season in Paris, I am on the prowl for a twelfth plate to complete the set (reader, if you find one for me at a bargain price, grab it quick!). The woman selling it to us tells us -- after we negotiate a price and she's wrapping them up -- that it used to be her grandmother's dish set. Which makes me kind of sad that she's selling them, but simultaneously happy that we're buying them. We tell her quite sincerely that they will be a very special souvenir of France for Gigi and that we'll appreciate them dearly. I don't think the seller is just giving me a line, either, since the sale had already been made. After buying the dessert dishes, with a souvenir Sacré Coeur mini-plate thrown in for free, we head to the beach. But Gigi can't get the pitcher we decided not to buy out of her mind. Since we have to drive by the vide maison again en route, we stop in, and sure enough, it's still sitting there, just waiting for its rightful owner to come claim it. They only charge us 5€, and we walk away happy. Happy, that is, until we're nearly done with our day on the other side of Ile d'Oléron, and we slap our foreheads: "You know, we probably should have just bought everything. Even the hot plates (which I don't like, but Gigi does)." So we stop in a third time. By now, they almost have certainly nicknamed us the "crazy Americans" -- les américaines folles . We buy the rest of what they've got, including another set of 3 Limoges vegetable-themed plates that Gigi declares she loves. At one point, she actually, literally, clutches one of the dishes to her chest; I believe it is the fennel. I have no pictures of the house, or the enormous vide grenier sign written on an old sheet and hanging on the street, because each of the three times we end up at the garage sale, I am too excited about buying more dishes to remember to take the picture. Our final total haul is 6 large plates, 1 serving bowl, 11 dessert dishes, 2 trivets, a pitcher, and a freebie souvenir of Sacré Coeur for the grand total of 30 euros. Looking on eBay, I feel like we probably could've easily spent that much on just one single dish. Or not. I'm not in it for the investment, so I don't really care: we just love the dishes and how very French they will feel when we're no longer in France. Anthony's right about one thing: it is highly impractical to carry it all back with us -- just Gigi and me, protectively clutching our porcelain, on the train and through the Paris metro system. But what makes it extra impractical is that we have to turn around and empty our own house, too, soon, because .... get ready for it....gasp.....we have to move out of our lovely apartment and home of four years. So now, we get to pack up and transport all these extra dishes, that we probably won't have room for in our new place (and barely have room for in our current apartment), so that somewhere years down the road, Gigi can serve you a slice of apricot tarte on a French-themed plate when you come to visit. 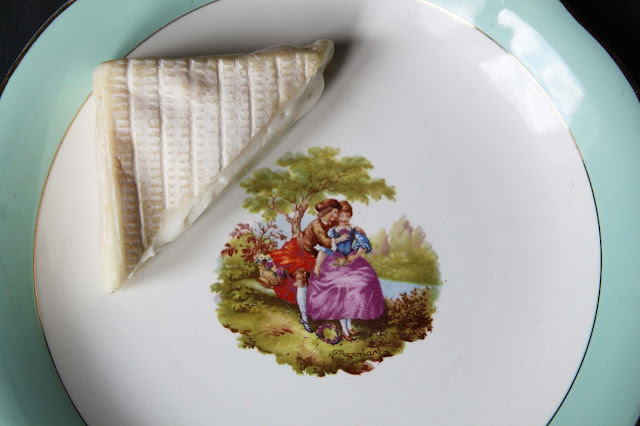 Saint Sauveur des Basques is a pasteurized, industrial sheep's milk cheese so high-end, I find mine at the Quatrehomme store in the 7th arrondissement. It looks like a cow cheese, feels like a goat cheese, but tastes like a sheep cheese. It's made like a cheap cheese, but tastes like an expensive one. The cheese is produced by Agour, a big dairy company that produces many other industrial cheeses. This one holds a special place in the Agour pantheon because it's the first cheese they produced in their newest facility, close to the Iraty mountains in the Pyrénées. So, if you know your Osau Iraty and your Basques country, you won't be surprised that it's a sheep cheese. It's the softness of it that's surprising and more unusual, as the sheep cheeses from this region tend to be hard and crumbly. St Sauveur des Basques is aged three weeks, during which time it is lightly washed and develops a yeasty-smelling, white bloom. Because it is pasteurized, it's even possible to find this one in the US; I know for a fact that Murray's Cheese Shop in New York City offers it, at least sometimes. The name of the cheese, "saveur", means "savior" but sounds like the related word "saver" -- as in all the money I saved by buying these dishes at a garage sale instead of an antique shop or online. And then there's the fact that it's one of the first cheeses I buy after the purchase, and I can't wait to photograph the Saint Sauveur des Basques on one of Gigi's lovely, teal, French, bargain, countryside dishes which, like the cheese, seem like they should have been very expensive but were, in fact, quite affordable.